border have new protections as the International Dark-Sky Association (IDA) announced today it has designated Hovenweep as the world’s seventeenth International Dark Sky Park. In designating the new Park at the Gold-tier sky quality level, IDA recognizes the notably dark skies over the Monument and efforts of the National Park Service (NPS) to protect them for future generations of visitors. It is the first IDA Dark Sky Park to span more than one U.S. state, and is the second IDA-accredited site in the state of Utah after Natural Bridges National Monument. Both Natural Bridges and Hovenweep are jointly managed under the same NPS administrative staff. “We are happy to welcome Hovenweep into IDA’s family of International Dark Sky places. It is the fifth such place in our program from the Colorado Plateau, highlighting the growing interest and importance of night sky protection throughout the region,”” said IDA Acting Executive Director Scott Kardel. While the Monument has very little outdoor lighting, receiving IDA recognition was contingent upon developing a formal plan to guide future park development and lighting installations. Superintendent Jim Dougan points out that the Monument’s Management Plan now “recognizes dark skies as one of several integral resources” that makes Hovenwee unique. “We have adopted energy conservation and efficient lighting as cornerstones to our public messaging about stewardship of resources in general and the night sky in particular,” Dougan explained. 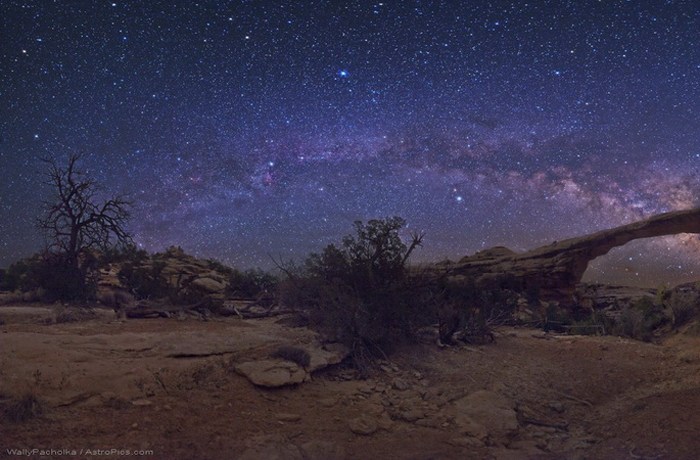 Hovenweep International Dark Sky Park consists of 785 acres (318 hectares) of federal lands divided among six non-contiguous park units along the Utah-Colorado border in the ‘Four Corners’ region of the American Southwest. It is particularly remote among the archaeological sites of the Four Corners and is noted for its undeveloped, natural character. The Monument takes its name from a Paiute/Ute word that means “deserted valley” and was adopted by pioneer photographer William Henry Jackson after his 1874 visit. Ruins of six prehistoric villages in the Monument, built between A.D. 1200 and 1300, testify to the ingenuity of their builders who flourished in a harsh, desolate landscape. Little has changed in the intervening centuries. Where the people of the Ancestral Puebloan culture once led hardscrabble lives in an unforgiving high-desert terrain, modern tourists to the Colorado Plateau now marvel at the art and architecture they left behind. They may also experience something quite close to the primordial nighttime darkness that existed everywhere before the advent of electricity and artificial light at night. Hovenweep’s seclusion has largely preserved its dark night skies in a condition similar to that of its 13th century heyday. Modern visitors to the Monument share their interest in the night sky with its ancient inhabitants. The Ancestral Puebloans were keen skywatchers, often deliberately orienting their buildings with points on the local horizon where the Sun rose or set on the longest and shortest days of the year. Evidence suggests that some Hovenweep structures, including its iconic “Castle”, were built with small openings in exterior walls, directing beams of the rising or setting sun such that they fell on particular construction features only on specific, important dates. Researchers believe these orientations turned the structures into calendar devices used to predict dates of planting and harvest, crucial information for a community of subsistence farmers. Recognizing that visitors to Hovenweep go far off the beaten path in traveling to its remote location, the Monument leadership has worked to provide a variety of activities that satisfy the longing for seclusion both day and night. To afford visitors a place to see the primeval darkness above Hovenweep at their convenience, the Monument is open 24 hours a day throughout the year. Despite limited resources, the Monument administration has acquired an 11” Schmidt-Cassegrain telescope and a pair of 10.5×70 binoculars for dark sky programs, which are held several times a year during the warmer months. Experienced amateur astronomer volunteers put on the programs. stewardship of the night sky. Designations are based on stringent outdoor lighting standards and innovative community outreach. Since the program began, seven Communities, 17 Parks and eight Reserves have received International Dark Sky designations.